short film, “Manhood” on Sunday, March 24 @ 5-7 p.m. in McKnight Hall! The film will also be shown in two other locations during the Underexposed Film Festival and the Charlotte Black Film Festival. The Film Studies Minor, housed in the College of Liberal Arts & Sciences, is an interdisciplinary program with courses in the departments of Africana Studies, American Studies, Art, Communications, Theatre, English, History, Languages and Culture Studies, Religious Studies, and Women's Studies. The Film Studies Minor offers courses that focus directly or implicitly on cinema. The program is designed for students who wish to understand film better as an art form, as popular culture, and as a major medium of communication. Join the UNC Charlotte Film Club! 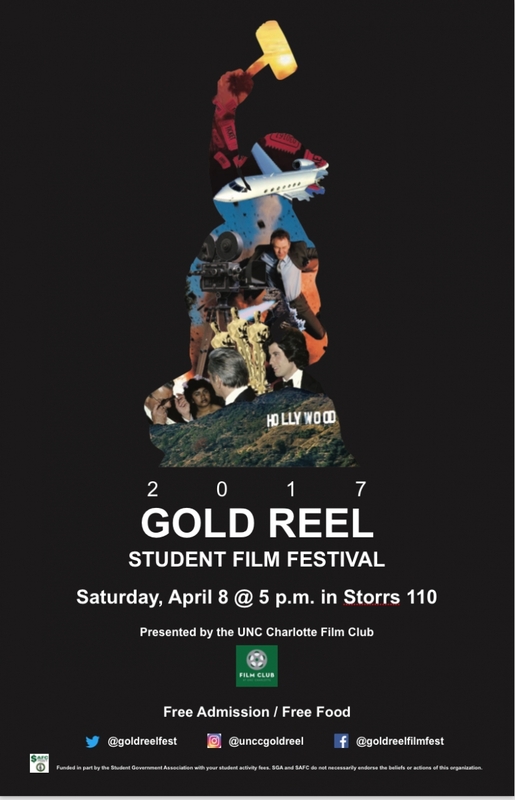 The Film Club at UNCC hosts the annual Gold Reel Student Film Festival each spring as a celebration of student filmmaking from all over the world. The 2017 festival had 100 submissions from 19 countries and had an audience of 130 guests in attendance. The poster was designed by Chelsea MacKinnon and Seth Wesner. Congratulations to the recent winners! 2016 Gold Reel Student Film Festival Winners. 2016 poster designed by Mark Borja. More information about the Gold Reel Student Film Festival is on Facebook.